Is your skin feeling de-hydrated? Are you drinking enough pure water to give life and moisture to your skin? Are you telling yourself, "I have melanin and because of melanin, my black don't crack"! Could you be maturing? Of course you are! When you begin to see signs of mature skin or challenged skin, the main component missing is moisture. Is it genetic, environmental or hormonal? As African American women, you can experience a sagging skin challenge as well as fine lines and wrinkles, skin discoloration and dark spots. And when it comes to hormonal challenges, OMG! If I could just get those three gray hairs under control that show up every three days, it would be great. I don't know about for you but waxing doesn�t get them, the electrolysis doesn't get them and I end up with a pair of tweezers (yes a complete no -no) and pulling them out, of freshly steamed skin I might add. You've often heard that you come from a great gene pool, so if your mom or your grandmother have beautiful skin, you're one of the few lucky ones. Aging as you know, is a continuous process and for some, its visible signs begin as early as your 20's. Collagen, elastin and essential proteins support your skins youthful firmness. But as you mature (age), the production of these proteins in your beautiful black skin begins to slow down and lose its density. Stress from the environment like extreme weather and pollution can take a toll on your skin. Remember moisture? Well when the sun causes damage, it inhibits your skin's ability to repair itself. Over time the water content in your skin will decrease and it will appear dry and brittle. Yes, it can happen to you. Estrogen, which is an essential hormone for soft, supple and firm skin, encourages collagen production. Collagen makes up your skin's support system, elastin is the corrective partner with collagen. Even with your beautiful melanin, your skin can become more fragile and thin with increased sagging and possible acne breakouts. Menopause, yes Men-on-Pause, can cause your skin to lose up to 30% of its collagen in the first five years of menopause. Your face has a high concentration of estrogen and menopause can cause deep creases, dull skin tone and sometimes a crepe-like texture. Cleanse, tone, moisturize and exfoliate. 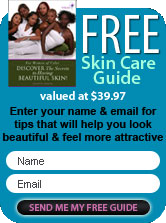 Your skin is the largest organ of your body and is extremely responsive to products that are applied to it topically. For maximum skin health, a basic skin care regimen And proper nutrition is all it takes. Green foods and a great nutritional supplement will aid your skin's health from within. Feeling and looking younger than your age? Good for you. Want to look and feel younger than your age? Begin with a great skin care regimen, lots of green foods and a positive mental attitude and you're well on your way.